After the Civil War, some free black families lived in Bauxite in tar paper shacks in segregated camps and worked the mines. By the 1880s some of these families had moved to Benton. At that time the Rhinehart, Canady, and Tyson families were living in a community that came to be called Gravel Hill. Wes Ashley purchased land there from a white politician named David Madison Cloud around 1907 when the Ashley House was built. The Barnes family is also one of note. Former NFL player turned biologist and zydeco musician, Bruce “Sunpie” Barnes grew up there as did NBA legend Glen Rice, who lived there as a boy. In 1894, Plessy vs Ferguson held that segregation was legal with the Supreme Court’s famous “separate but equal” verdict. In 1954, another famous case, Brown vs the Topeka Board of Education, overturned that decision. In 1957, nine students dubbed the Little Rock Nine attempted to attend Central High School in Little Rock. Governor Faubus blocked them but President Dwight Eisenhower utilized the army to enforce the law. Eventually, all nine students graduated. In 1964, the Civil Rights Act was passed by Congress and segregation was officially ended nationwide. Meanwhile in Benton, Arkansas, segregation was still a fact of life. Benton Schools were to be integrated “quietly and smoothly,” according to Perrin on Sept. 9, 1965. The Benton Courier reported that there were 110 black students attending Benton schools by then with a reported 169 black students still attending Ralph Bunche School, which was built in 1947. 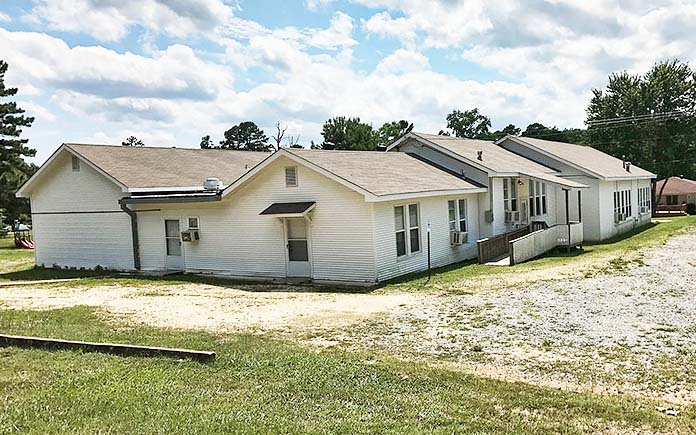 In Benton, the school board decided to start from the elementary school level and work their way up beginning with Angie Grant Elementary on Border Street near the high school. It was not until 1966 that Benton High School would see its first African-American graduates. Charlene Dawn, one of those graduates, said “to be a senior was a little lonesome,” and that “for the most part we were tolerated.” But she added, “I promised my mother that nothing was going to stop me from getting my diploma.” There was no violence and in time some lifelong friendships were forged. In 1968, Ralph Bunche School was closed, and integration was completed without issue. In 1969, the school building was converted into a Head Start pre-school by the Central Arkansas Development Council (CADC) as part of President Johnson’s War on Poverty. 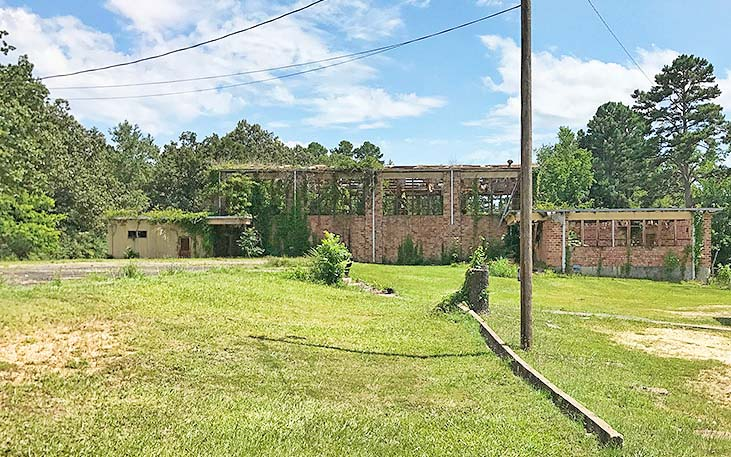 The multipurpose building was left abandoned until the Men’s Alliance of Saline County purchased it and the remaining buildings from the city in 1976. There are talks about turning it into a Civil Rights Museum. 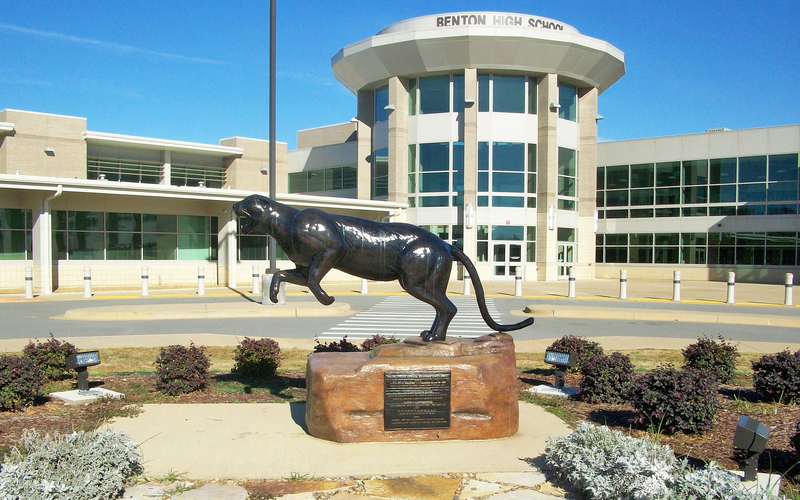 From 1966 to 1986, Benton had two separate junior high schools, Eastside and Westside, who played against each other as the Cougars and Bulldogs respectively. The CADC was led for thirty-seven years by Charles F. Cunningham, who lived in the community until his death in 2017. Cunningham and his wife, Josie, came to Benton from Tennessee to be teachers at Ralph Bunche School. After the school was closed, Cunningham became involved in politics and the development of CADC. In 1969, Josie sued the Benton School District. Josie was a college graduate with a degree in home economics, a minor in general sciences and certification to teach both. After integration, Josie was made a physical education instructor and librarian in elementary schools. She alleged that she was not transferred to Benton High School based solely on her race. She won the lawsuit and was offered a job teaching at Benton High School with a salary comparable to other teachers at the time. Charles became Benton’s first African-American mayor in 1981. In 2002, the community formerly called Gravel Hill, now known as Southside, changed its name again to honor Nobel laureate Ralph J. Bunche. Bunche was the first African-American to be awarded a Nobel Peace Prize. In November 2017, Bryant School District honored its first black graduates, William Wallace, Ronald Wallace, and the late Kenneth Jones of the Class of 1966. In February 2018, Benton did the same during a Lady Panther game. Plaques were made for Lois Gooding, Charlene Dawn, Amel Heard, Florence Ruby Allen, Mary Franklin, and the late Andrew Cox. One listing all of their names was hung at Benton High School in the Benton Athletic Memorial Museum. Sadly, Florence Ruby Allen passed in April 2018.